Jessica Skultity at The Wonky Press (issue #39: Why I’m Writing a Book, Bright Yellow Quilts, and Some Great Links) has said some kind things about a little quilt I made earlier this year. Since it was for a baby, I used bright yellow and orange, accented with green. I had trouble with the photo, which is why Jessica had to run it too small. Here it is in a bigger format. The colors are a bit washed out in this photo, but you get the idea. 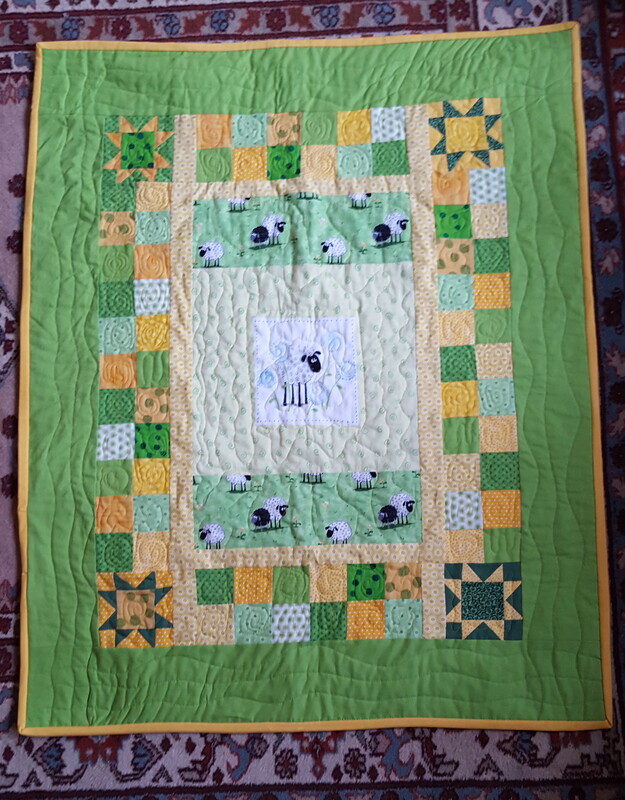 It was a gift for a baby, who surely won’t care about the wonky machine quilting. This entry was posted in Create, Gifts. Bookmark the permalink. Fran, the light, bright colors are wonderful and the wonky machine quilting makes it charming. Had the quilting had been controlled it would not have felt like a hand made project. I really love this.